I needed to do an RV Closet Remodel to gain the storage I needed. 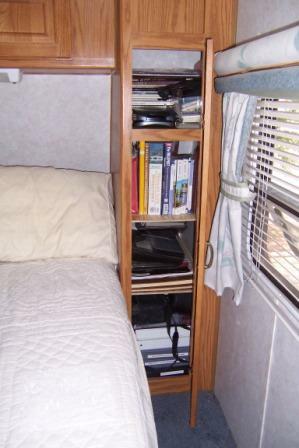 As I'm sure you already know, bookshelf space is at a high premium in an RV. It's extra short in a less than king sized fifth wheel. I have a pretty good collection of notebooks, computer paper, manuals, guide books, back up hard drives, yadda, yadda, yadda, for working on this website as well as my leather craft. I compound that with an ever growing collection of books, maps and other foo fur raw for researching the navigation for our travels. junk, deep in the back of some rv compartment. And, usually I can't even remember which compartment it's in... let alone where in that rv compartment. I'd already done one RV pantry remodel so I thought this RV Closet Remodel would be a cinch. To tell the truth it was, once I got past the initial realization all my tools were gone! I never got to this little project before we moved out of the house, and it's 1000 sq. ft. shop! It was at the end of our first week, full-time in the Eagle when I finally got the time to do this RV Closet Remodel. OK, You know the drill... there are three closets. One large one in the bedroom area, a medium size by the entry door and another medium size closet back in the rv bathroom. I don't need to tell you that the Queen Bee herself commandeered the Big one in the bedroom do I? The medium sized closet up by the entry door was the only likely place for our coat closet... which it has always been... so that left me with all my goods that needed hanging, in that bathroom closet. No big deal. My gear fits in there purty snug. I don't carry anywhere near the amount of 'fashions' most gals do... I ain't complainin' now mind you. I'm just sayin'...... I'm just sayin'.... I think I'll get on with the story about the RV Closet Remodel, before I dig myself in any deeper! The problem I've had is that all the books and papers I use for writing my sites as well as roughing out the itinerary for our trips has always been scattered around in several drawers, boxes and piles on the dinette or couch. Not a very shiny setup. So I put that mushy thing keepin' my hat from blinding me to work, and came up with this idea. Along side the bed are two narrow 'shirt' closets. Too dang small to be useful for very much, and they always seemed to be wasting a lot of space to me. A prime subject for a Cowboy carpenter, RV Closet Remodel wouldn't you say? Didn't take much. I just pulled out the clothes bar. Hung six brackets per shelf and installed a plywood shelf. The brackets I got at Home Depot from in amongst the joist hangers and hurricane clips. Six per shelf should give me plenty of support even if they are only anchored into the paneling. I ain't planning on hauling bowling balls on these shelves! The ply I had to get cut to fit. There I was with a whole shop full of planers, joiners, table saws, miter saws, drill press, clicker, etc. and I didn't get this done! And now we're living in the rig and no tools to speak of! No matter. If you need a piece cut to exact measurements, the guys at the depot will cut it for you. Actually saves having to haul the tools around anyway! I should quit my grousing about it don't you think? I mean, somebody else had to do that work and all I had to do was stand around lookin' decorative! 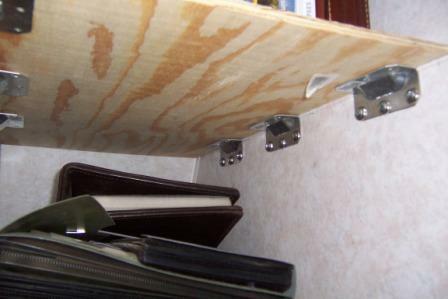 Now, this RV Closet Remodel was a lot like the RV Pantry ... except even tighter. Trying to reach back in there to run a screw, when I was already wedged down along side the bed was a bit of a contortionist test. Let me tell you, I don't contort as well as I used to! Couple times I thought I was stuck... I wonder if Heidi would have quit laughin' long enough to drag my keister out of that closet had I truly got stuck? As I was doing this RV Closet Remodel chore, Heidi wanted me to hang her gizmo bag... a gizmo bag is one of them canvas bags that hang over a door with a couple hooks. It holds all the 'gizmos' you can't find no other home for. In a house, they don't work too bad. In an RV they'd swing all over town... and make a mess I believe. Unless!... you take them hooks off that usually hang the bag over the door, and use finish washers and screws. 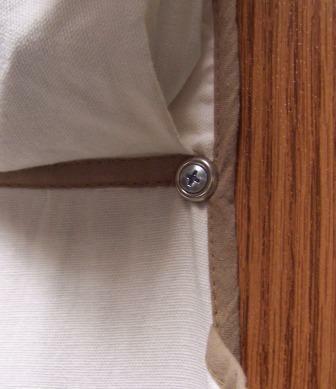 I just put three across the top, through the grommets where the hooks had been. Then, down each side, at each main seam I put another finish washer and screw. 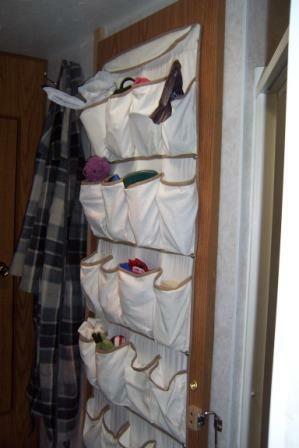 The end result is a gizmo bag, solidly secured to our RV bathroom door (which I also just remodeled) with a truck load of pouches to hold a goodly amount of miscellaneous, precious junk! I could only do this deal if the door was hinged and not a slider like it was... another plus for changing the door. 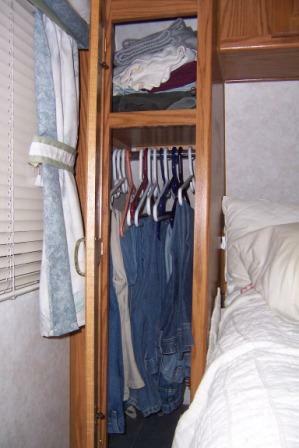 A couple simple RV Closet Remodel jobs. Similar projects can improve the function of your rig I'm sure. Hope this gives you an idea or two. I may even get another one of those canvas gizmo bags. The doors on Heidi's closet are about 'half' doors... Hmmm... If I took one full size bag and cut it in half.... I'll bet she could hang her shoes in her closet! One more tangled mess taken care of with a simple RV Closet Remodel!